Cost: Admission to JCCC is free while screenings and concerts are ticketed. Please be warned that there is no ATM machine on site. TAM Films – $10 except Shima Jiro which is $5. Tickets/Passes can be purchased in-person at the Japanese Canadian Cultural Centre Reception or call 416-441-2345. Also available at Ticketweb. JM FEST – Tickets/Passes are available at J-rock website. Also available at the door. JCCC members receive $5 off door rate with membership card. 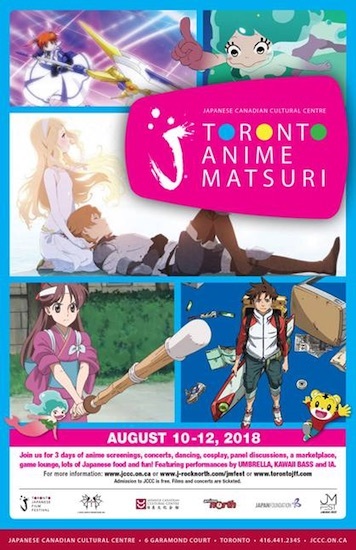 Details: The Japanese Canadian Cultural Centre (JCCC) and Toronto Japanese Film Festival (TJFF) are announcing the inaugural edition of Toronto Anime Matsuri (TAM) at the JCCC. TAM is a new festival of Japanese contemporary pop culture featuring anime screenings,music concerts, cosplay fashion, panel discussions, a marketplace, game lounge and, naturally, lots of Japanese food. TAM’s program of seven films includes new animation from the latest wave of Japanese anime directors including Masaaki Yuasa’s modern fable Yu Over The Wall, Mari Okada’s fantasy Maquia: When The Promised Flower Blooms, Tomoki Kyoda’s sci-fi action thriller Eureka Seven – High Evolution and Kazuhiro Furuhashi’s period romance Haikara-San: Here Comes Miss Modern. At TAM, JM FEST will also showcase up and coming artists, as well as popular musicians, from North America and Japan over a period of two days. Visual Kei band Umbrella, Virtual Artist IA, Japanese Idol Group Pastel and a special after party ft Kawaii Bass are among those making appearances. « Taste of Nature: Raise Money for Parks Canada by Sharing Nature Selfies!